“You’re entitled to your own opinions. You’re not entitled to your own facts.” Attributed to US Senator Daniel Patrick Moynihan. Gen. V K Singh’s appellation of “presstitutes” in a Tweet caused a storm of responses in the media. “This is, it seems, open season for name calling against the media. 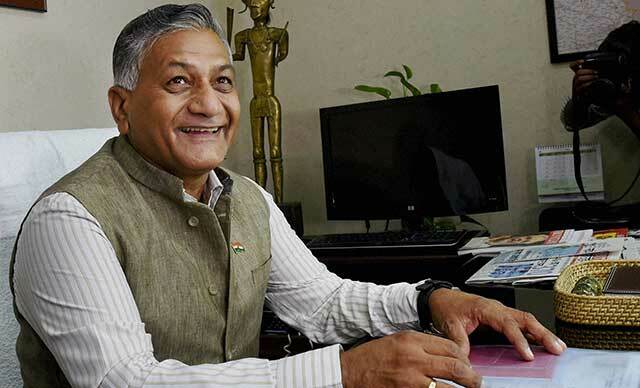 The Union minister and former army chief, General VK Singh, describes journalists as ‘presstitutes’. “More dangerous is the message that is now being imbibed by the cheerleaders of the BJP. If any criticism of the government is seen to be an example of ‘presstitution’ or ‘news trading’, then there seems to be a deliberate and insidious attempt to muzzle all dissent. Mr. Sardesai is a veteran journalist and media insider and may well know of the rewards of being a fellow traveller of the government. However as an outsider and avid consumer of Indian news media, as well as someone active in social media, I have a different perspective. The point is not of opinions that are critical, as Rajdeep says. The angst is when opinions masquerade as facts, and facts are themselves falsified or presented in a distorted way to push political agendas. It is true that Social Media has been critical of Indian MSM. But it is specious for Sardesai, writing in the Hindustan Times and been part of mainstream TV channels, to label himself as the alternative voice questioning the dominant narrative. Social media is more democratic. It is not always polite, but it is the challenger to the dominant voices in the mainstream media. The loss of credibility of mainstream media is not because of a diversity of opinions. The angst in social media, or at least my angst, is not when Indian news media carry a diversity of opinions. It is when facts are deliberately distorted and politically coloured, so that the media cannot be relied upon for basic reporting and coverage. This takes several different forms. The first, as I pointed out regarding the coverage of “church attacks” is in selection bias, choosing news to fit a narrative. Even more egregious is outright distortion and falsification of facts for political colour. The case that General V K Songh took objection to was coverage of his sarcastic cut at the media for their hyped up coverage of his visit to the Pakistan embassy versus what he considered the muted coverage of India’s remarkable efforts are evacuating Indian nationals and others from Yemen. Even Sardesai admits “some news channels chose to perhaps deliberately misread the sarcasm in Singh’s remarks comparing his leadership of the Yemen rescue efforts with his attendance of the Pakistan national day celebrations. “So, the husband follows the contract terms. Till the time, the wife follows the contract, the husband stays with her, if the wife violates the contract, he can disown her,” Bhagwat told a rally in Indore on Saturday. Variations on the same theme were carried by other reputed mainstream news media. Times of India carried the remarks that India Today did, but then added some additional elaboration. “A husband and wife are involved in a contract under which the husband has said that you should take care of my house and I will take care of all your needs. I will keep you safe. So, the husband follows the contract terms. Till the time, the wife follows the contract, the husband stays with her, if the wife violates the contract, he can disown her,” Bhagwat told a rally here yesterday. Serving out an advice for happy marriage life, RSS chief said marriage is successful only when wife looks after the household things and husband looks after the earning and outside work. “This system is also good for society and ensure proper order in society,” Bhagwat said. This has come quickly upon the heals of yet another discourse, this time on the nature of marriage by the same Shri Bhagwat of the RSS: marriage, he opines, is a “contract” wherein the wife agrees to keep the husband pleased, and the husband in turn agrees to keep the wife secure and fed. After such knowledge, what forgiveness. The only problem with all these accounts is that they are either outright fabrications, like NDTV’s headline, or they are complete distortions, attributing to Bhagwat meaning which is the opposite of what he said. I generally seek out the original video of the complete speech to verify media reported remarks. Here are links to the original speech. The second speech is the more complete, though it is only audio, so a little less reliable. Now there can be perfectly legitimate criticism of what Bhagwat said. One could argue that this was always so, and not a recent attitude as Bhagwat claims. One could also advance the materialistic argument and say what is wrong with marriage being a contract. One could also denounce marriage, like Sheila Cronin, leader of the feminist organisation NOW: “Since marriage constitutes slavery for women, it is clear that the women’s movement must concentrate on attacking this institution. Freedom for women cannot be won without the abolition of marriage” and criticise Bhagwat for upholding the view of marriage as a sacrament. Rather the gamut of English language mainstream media in India misreporting Bhagwat as advocating that women are “meant to do household chores (sic)” (NDTV) and “if the wife violates the contract, he can disown her” (Times of India). The first is an outright lie, we cannot find anywhere where Bhagwat says that the women are meant to do household chores. The second, reported repeatedly, is a distortion since it is presented to seem like Bhagwat is advocating the viewpoint of marriage as a contract, whereas he is criticising it as coming from (Western) materialistic viewpoint. If the original speech took me a simple Google search to find, and anyone who understands Hindi and hears the entire speech would be hard – pressed to dispute the fact of what Bhagwat is obviously saying, the question arises why so many different major media reports got the facts of the speech wrong. The quote at the beginning of the article holds some clues. “You’re entitled to your own opinions. You’re not entitled to your own facts.” Unfortunately we find that reporting of facts in Indian media has become ideology driven. News reports are driven by religion and politics. Often times, the journalists and editors biases show up in everyday news reporting. Some of this is normal human behaviour, but when such distortions become routine it causes the kind of backlash seen in social media against mainstream Indian media. It also affects the credibility of Indian media is a news source. Many examples can be mentioned, including the infamous misquote of Narendra Modi allegedly “justifying” the post-Godhra riots by citing Newton’s law. I leave finding the original correct quote as an exercise for the reader. Nonetheless this “quote” found its way into numerous international reports. Just like in the case of Bhagwat’s misreporting, falsehood is difficult to counters when it is repeatedly cited without any reference to the original. Manufactured news becomes truth, and the subject of analysis and scholarly research.
. @rupasubramanya there is no better cure for any illusions about our media than reading or viewing a story u actually know something about! Former Chief Copy Editor of Hindustan Times Rakesh Kumar Simha, writing in Swarajya speaks of his experience where a potentially fake communally sensitive incident was set to print by a gung-ho reporter, supported by ideological peers, when it was not backed by the facts. In the pre-Internet days, manufacturing consent, and dissent, may have been easier. But with great access to original sources, the Indian news media needs to raise their standards, or bear the brunt of the epithets. It particularly needs to understand the difference between fact and opinion. Opinions serve a very useful purpose but are best kept to the editorial pages. This is Journalism 101 that I’m sure everyone in the journalistic community is well aware of. We will learn to trust Indian media reporting more if they can remember to adhere to this more often.